» Notre Dame Credit Check: When Will It Be Safe to Trust the Fighting Irish? Notre Dame is no stranger to opening with a bang before vanishing late. So is there any reason to believe the current edition can deliver on its early promise when its hyped predecessor(s) have fallen so woefully short? You have questions, we have answers. Notre Dame: Either you love the Fighting Irish, hate them, or feel a curious ambivalence toward them not represented by the prevailing love/hate binary. But regardless, can you trust them? 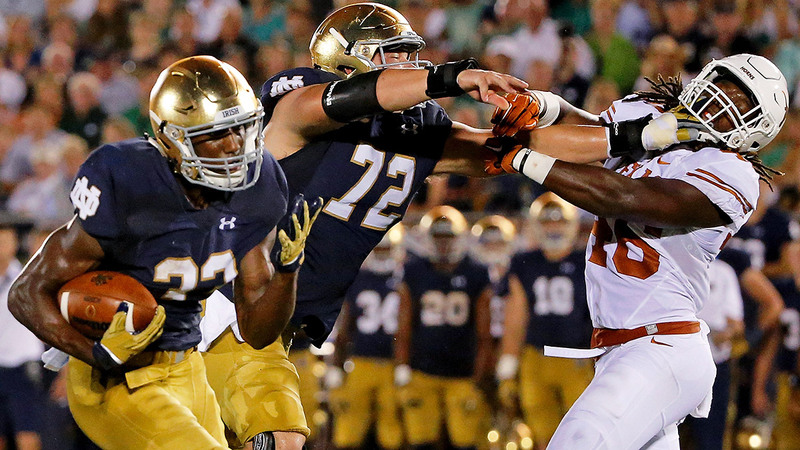 After exceeding even the most optimistic preseason projections in Saturday’s 38-3 annihilation of Texas, the 2015 Irish look like sterling bets to possibly emerge as one of the most complete teams in the nation and to make the College Football Playoff. The 35-point margin of victory was the most lopsided opening-day spread against a major-conference opponent, thanks largely to a Notre Dame defense that held the Longhorns to fewer total yards and points than any other Power 5 offense managed. With that win on the books, ESPN’s Football Power Index now calculates that only three other FBS teams (Ohio State, Baylor, and TCU) have a better chance than the Irish of running the table, and two of those three have to play each other. If all of that sounds familiar, it should: This time last year, the Irish were propped up by an equally thorough blowout, 31-0 over a downtrodden edition of Michigan, an early salvo en route to a 6-0 start and a top-five ranking in the AP poll by mid-October. From there, they proceeded to lose five of their last six to close the regular season, the kind of outright collapse that’s guaranteed to give confirmed Irish haters ammunition (as if they needed any more) for years to come. At its peak, Notre Dame was ranked as many as nine spots ahead of eventual champ Ohio State, and it came in six spots in front of the Buckeyes in the first Top 25 released by the selection committee. It ended the season unranked, watching the New Year’s festivities unfold in the wake of a meaningless win in the Music City Bowl. So is there any reason to believe the current edition can deliver on its early promise when its hyped predecessor(s) have fallen so woefully short? You have questions, we have answers. How long before the new quarterback cracks like the last one? Going overboard following an enticing debut is a time-honored college football tradition, one I’ve already addressed this week in my assessment of UCLA’s freshman phenom, Josh Rosen. The same caveats certainly apply to Notre Dame’s Malik Zaire, who was arguably the only quarterback who turned in a better Week 1 performance than Rosen, and who has seen up close how quickly hosannas can turn to hisses: His predecessor, Everett Golson, went from viable midseason Heisman candidate last October to transfer candidate in a little under six weeks, the casualty of a crippling turnover binge during the losing streak and a solid turn by Zaire in his first career start in the bowl game. Golson shipped out for Florida State in the offseason with an 18-5 record as the Fighting Irish starter but hardly anyone arguing that coach Brian Kelly was making a mistake in letting him go. So yeah, Saturday’s triumph over Texas was only one game, the jury’s still out, and all of that. But it was a damn near flawless game, one in which Zaire completed a higher percentage of his passes (86.4) for more yards per pass (14.2) and a significantly higher efficiency rating (250.9) than Golson managed in any of those categories in any of his 23 career Notre Dame starts. Zaire’s passer rating and Total QBR (96.1) both ranked as the best in the nation against a major-conference opponent, and not as the result of a bunch of broken tackles on bubble screens. All five members of the main wide receiver rotation (Will Fuller, Amir Carlisle, Chris Brown, Corey Robinson, and Torii Hunter Jr.) came down with at least one catch for 15 yards or more; Zaire’s favorite target, Fuller, came down with four, including a 66-yard dagger in the third quarter. The only things we didn’t see from Zaire on Saturday were (a) a turnover, and (b) the ready-and-willing athleticism he flashed on his way to 96 rushing yards in the bowl win over LSU.1 But we certainly saw enough to concede (for now) that Kelly made the right call when he let Golson walk away. Zaire was credited with 16 rushing yards on nine carries, including a sack for minus-12 yards. No question about that: The Longhorns looked like an outfit spiraling toward rock bottom, especially on offense, where they’re no closer to finding a viable quarterback or figuring out what they’d want to do with him if they ever do.2 Defensively, though, it was supposed to be another story: Last year, Texas led the Big 12 in yards per game and yards per play allowed against FBS opponents, as well as in Defensive S&P+; this year, UT was projected to rank eighth nationally by the same measure, again the best outlook in the conference. (The Longhorns were also projected to field the Big 12’s stiffest defense according to FPI.) Instead, the Irish racked up more total yards on Saturday (527) than any opposing attack has hung on a Strong-coached defense since 2011, his second season as the head coach at Louisville, on more yards per play (7.0) than any Strong D has allowed since 2012. And if the Irish had any reason to keep the pedal down in the fourth quarter, it could have been a lot worse. 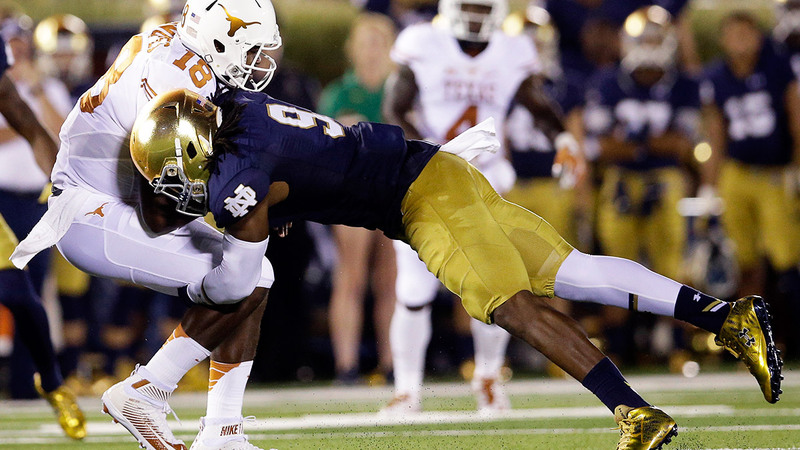 Nam Y. Huh/AP Jaylon Smith is a beast, but Notre Dame’s defense has a lot to prove after faltering last season. OK, but what happens when the Irish face a decent offense? Even beyond the quarterback, Texas’s ongoing lack of offensive identity is baffling. Earlier this summer, head coach Charlie Strong told me he considered senior tailback Johnathan Gray — reportedly healthy after enduring a succession of injuries the past two years — the best player on the team. But Gray didn’t touch the ball in South Bend until the final minute of the first quarter, by which point Notre Dame already led 14–0, and he finished with just eight carries for 40 yards. Not surprisingly, Strong didn’t bother at his weekly Monday press conference to extend a token vote of confidence to his offensive coordinator, Shawn Watson. Good question: Even more so than Golson’s abrupt descent into turnover madness, the defense was the scapegoat of the 2014 collapse, yielding at least 31 points in each of the last seven regular-season games (as well as 28 points to a bad LSU offense in the bowl game). But that injury-ravaged unit wound up starting 20 players over the course of the season, and it badly missed brainy middle linebacker Joe Schmidt after he went down with an ankle injury in early November. Now, those growing pains have yielded a long-in-the-tooth lineup that features a dozen upperclassmen with significant starting experience coming into the season, including Schmidt, future first-round draft picks Sheldon Day (at defensive tackle) and Jaylon Smith (at linebacker), and cornerback KeiVarae Russell, another favorite of pro scouts who’s back in the NCAA’s good graces after missing all of 2014 amid an academic investigation. The defense is one of only five nationally whose members entered the season with more than 200 career starts between them, so the potential exists for that group to carry the day if it has to. And although it didn’t have to against Texas, it’s still so far, so good for the Irish D: The Longhorns needed virtually the entire first half to cross midfield and never got as far as the red zone. But snuffing out an anemic UT attack doesn’t tell us much about how the same defense will fare against Georgia Tech on September 19, or against Clemson (and Deshaun Watson) and USC (and Cody Kessler) in October. Talent-wise, the Irish are fine; as for the results, ask again later. And aren’t they already a little banged up? Two returning starters, Tarean Folston and Jarron Jones, are done for the year after knee injuries, costing Notre Dame its best tailback and its best interior pass-rusher. Another once-touted running back, Greg Bryant, is also on his way out after failing to live up to his blue-chip recruiting hype over the past two years. Between Folston, Bryant, Golson, and the departed Cam McDaniel, last year’s top four rushers are all out of the picture. But there was no apparent drop-off in the opener from Folston, who left the game in the first half, to converted slot receiver C.J. Prosise (20 carries for 98 yards) or the true freshman tandem of Josh Adams (five carries for 49 yards, two TDs) and Dexter Williams (seven carries for 24 yards). Prosise, who ripped off a 50-yard touchdown run in the bowl game, and Adams, who broke a 25-yard touchdown run against Texas, have already flashed big-play potential in limited opportunities. If the offensive line is consistently as good as it was in the opener — yet another if, I know, but still — how the carries get divvied up behind it won’t matter much. Jon Durr/Getty Images Amid injuries and attrition, true freshman Josh Adams could help fill Notre Dame’s tailback void. But don’t you click-happy media hacks always overrate Notre Dame, and doesn’t it always blow up in your faces? Since 2000, Notre Dame has appeared in the preseason AP poll eight times and has not appeared in the preseason AP poll eight times; only once (in 2006) have voters projected Notre Dame into the initial top 10. Four times in that span, the Irish finished ranked after beginning the season unranked, including their only top-10 finishes, in 2005 and 2012, when they played for the BCS championship; five times they’ve finished unranked after being ranked to begin the season. 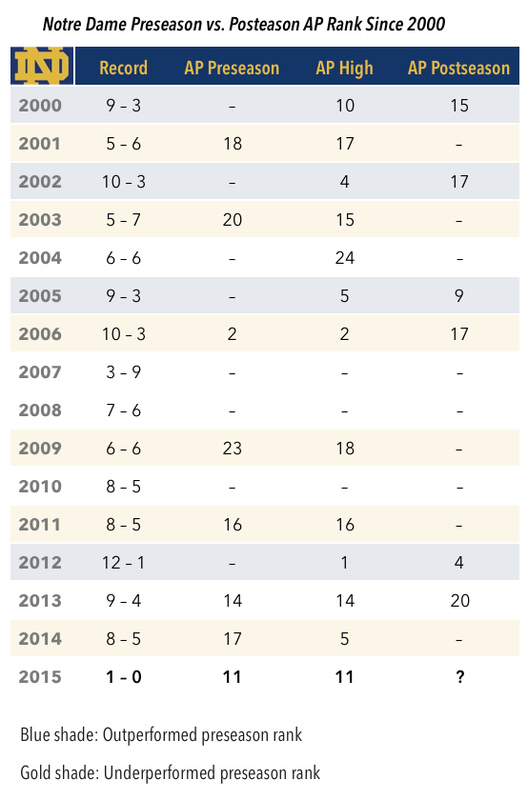 Only twice (in 2006 and again this year) have voters deigned to elevate Notre Dame more than four spots higher than it finished the previous year. Meanwhile, they dropped the Irish 10 spots from 2012 to 2013 and had enough foresight to keep them out of the poll altogether ahead of the 3-9 debacle of 2007. If anything, Notre Dame has tended to outperform expectations about as often as it underperforms them. Still, while the Irish haven’t reaped any rewards they haven’t earned, it is true their occasional forays into high-stakes territory this century have all ended in humiliation. Before last year’s swoon — capped, as you may recall, by a 49-14 flop at USC to close the regular season — their forays into BCS bowls yielded an 0-4 record and a margin of defeat of a little over 25 points per game. The 2006 team, which opened at no. 2, was bounced from the national conversation in an early blowout loss to Michigan and closed with consecutive clubbings at the hands of then–no. 3 USC and then–no. 4 LSU in the Sugar Bowl. And the 2012 team in particular, which (deservedly) punched its ticket to the BCS title game against Alabama, looked as overmatched when it got there as any outfit boasting a 12-0 record and the nation’s no. 1 scoring defense could have conceivably looked. As far as the current team is concerned, though, 2012 is ancient history. (A handful of fourth- and fifth-year players were around for that campaign, but among 2015 starters, only Russell saw any meaningful time on that squad.) As long as this Notre Dame team harbors serious playoff ambitions, though, and the closer those ambitions come to fruition, the larger the championship no-show against Alabama will loom for everyone else. The only way to erase that representative catastrophe is to keep winning, and eventually to win big, which this outfit pretty clearly has the talent and opportunity to do. Until it does, though, it’ll be hard to blame anyone for refusing to believe it until they see it.